The Governor race has entered crunch time. Debates, ads, press conferences; charges and counter charges; who did not do what, when, and to whom. it’s all there, the political air is full of missiles, bullets, and even a couple of stink bombs. 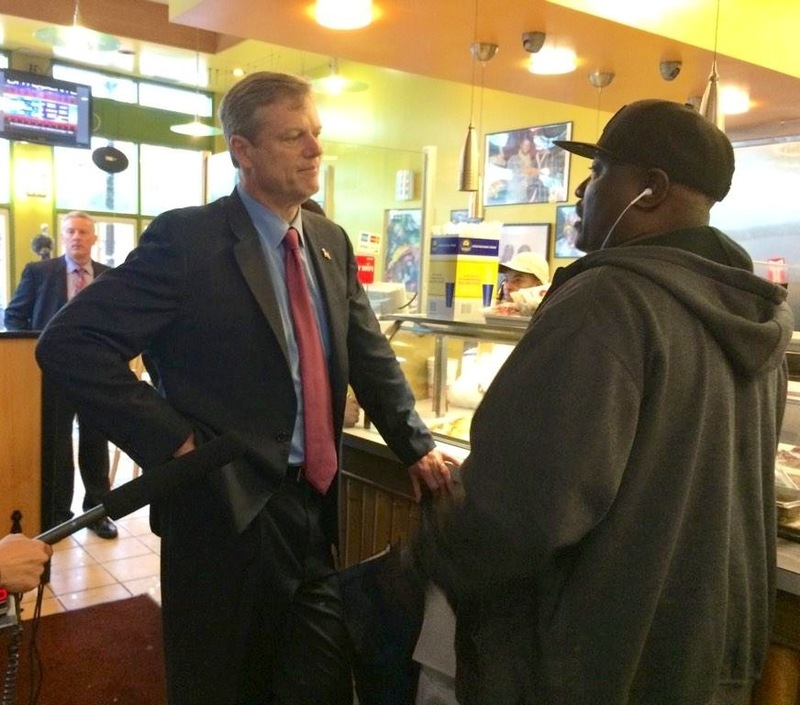 And that’s OK.
As crunch time begins, the race looks close if you follow the polls : yet every instinct and observation tells me that Charlie Baker is ahead, probablysignificantly. He has three times the cash in his campaign coffers that Martha Coakley holds, and the dollars keep on dialing in. Baker is winning important endorsements; wowing attendees at Forums; manoeuvering his message one step ahead of the Coakley train, broadenming his ,message ever wider than Coakley’s briefcase sights. Baker used the summer weeks brilliantly to plant his campaign squarely in the big cities (especially in communities of color) and on the North Shore, and he has doubled down on both regions since. The move appears to have caught the Coakley campaign by surprise — or which she is not to be faulted, as until now no GOP candidate in Massachusetts had, in decades,risked a major big city effort. Baker has done it, and it has succeeded : polls show him tied with Coakley in Boston and its immediate suburbs, a region where in recenmt elections a GOP candidate loses by 20 to 30 points. Recently, Baker has begun a major push in the winnable western suburbs of Boston (Framingham, Natick, Wellsley, Wayland, Weston, Needham and such) — a region that since the 1990s has trended inexorably to the Democrats. Now comes Baker, with a message of all-in on women’s health and gay rights that has begun to win him friends in this progressive values region (where cDemocratic hopeful Don Berwick won many votes on Primary Day) : as has his emphasis on aligning education with technology, reform of state administration and — Baker’s powerfully authoritative presentation both in ads and face to face. And in debate. 1.She has aksed the Democratic party to help her . Dooes she not see that a governor ought to help the party, not the party the governor ? Help in politics comes to those who show the ability to profit by it. 2.She appears at rallies with a phalanx of top Democratic office holders, when far hetter would be fpr her to stand entirely alone, at press conferences and at rallies, and focus the voyers’ eyes on her and only her. A Governor should not need a crowd around him or her in order to appear important. 3.She evidently refuses to embrace the underdog position, despite its power to move people. Granted that few Democratic politicians in Massachusetts ever find themselves the underdog and so don’t really know how to make underdog status an advantage. 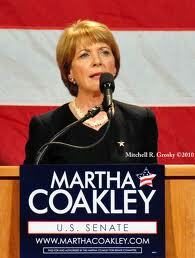 Coakley not only appears not to know how, but even to deny that she’s in it. Coakley has gone on the attack, but her attack opens up her own record — a long record as prosecutor and overseer of charitable institutions, and an uneven, even at times shameful record it often is, on issues of all kinds, narrow and broad. Team Coakley seems to have expected the baker campaign to be a typical 2008-2012 Republican one : right wing on everything (or almost), rural, base-oriented. Instead, Coakley got a Baker campaign progressive on much, fully committed to LGBT issues and women’s reproductive choice, very much a big city campaign in tone and presence, and a campaign always welcoming, always positive. Donors are not fools. They can sniff a winner. They give nore to a winner than tio a likely loser. Even “PAC” money isn’t bottom;ess. The Democratic party can call on many well-funded PACs, but donors even to PACs spare scant money for lost causes. The Democratic party’s first priority right now is to win enough US Senate races to retain control. (there are at least twelve senate seats in play.) I doubt that the Party has much time or funds on hand for a weak candidate fior governor, an office with no national party implications or consequences. Meanwhiole,. Baker and his running mate Karyn Polito raised a cool million bucks in September — to Team Coakley’s 330,000 — and Baker’s fundraising is still gaining speed. He will get his message. Can coaklry deliver hers ? Only if she embraces the unerdog position fully, utterly, passionately ; which means main-theming an issue, one issue on;ly, an issue powerful enough, and her advocacy of it convincing enough, to make voters take a second look and rethink their choice.